Unless you actually work on a farm, it's hard to get excited over toy versions of farming equipment. 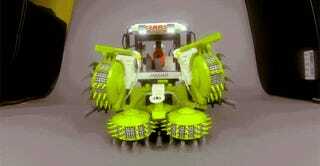 But Michał Skorupka—aka Eric Trax—has somehow made us want to tear down the Lamborghini and Ferrari posters on our walls, and replace them with images of a Claas Jaguar forage harvester. Or at least his perfect Lego recreation of one.